Some time ago I put together this quilt from fabrics I have collected on my travels around the South Island. 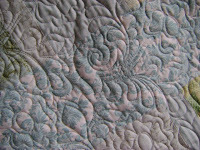 I had it quilted by Alison Bufton, in Ashburton. She made a lovely job and I am very plaesed with it. We had family to stay for the long weekend and the quilt was on the spare bed and received some lovely comments. My Aunt from the States wanted to take it home. Well the visitors have moved on there way back up to Nelson and the quilt is still on the bed. 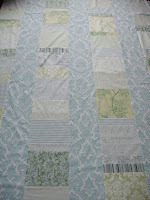 And this is a shot of the topper before it went away to be quilted. Not much happening in the way of quilts or stitching at the moment, far too busy traveling around for work.